After the launch of Samsung S8, Samsung is gearing up for the launch of Galaxy Note 8. The device which will be the key focus of Samsung as last year device from note series Note 7 was in the news with all the Bad reasons. As per the recent reports, the upcoming Samsung Galaxy Note 8 Smartphone in late summer will allegedly have a 6.3in bezel-fewer screen, similar to the Galaxy S8 model, a video leak showed Friday. In a nine-second video posted on China's Weibo, a front panel of what is claimed to be Samsung's next flagship Smartphone was revealed, raising assumptions that it is highly likely to adopt the company's Infinite Display that drastically reduces the area of the bezel width. Display aside, the Galaxy Note 8 also looks set to address two shortcomings in the Galaxy S8 and Galaxy S8 Plus. First, it is expected to integrate the fingerprint reader into the display (not ludicrously beside the rear camera). Secondly, it should feature dual rear cameras, a feature which was dropped last minute from the Galaxy S8 and Galaxy S8 Plus. In addition to this, the Galaxy Note 8 is also rumored to feature a 4K resolution display to accommodate for the larger screen size and offer better VR capabilities than what are currently available on other Smartphones. The South Korean manufacturer is also reportedly working on integrating the fingerprint sensor into the screen in an attempt to address a major design flaw of the Galaxy S8. Samsung is expected to unveil the Note 8 in September this year, but the company has a big job on its hands convincing consumers to trust the brand after the Note 7 debacle. Samsung had reportedly attempted to feature the dual-lens camera for the latest Galaxy S8 series, but it was ditched at the last minute due to high costs and some design issues. Apple's iPhone 7 and LGs latest G6 Smartphone’s feature a dual-lens camera that enhances picturing functions. The dual-lens camera on the Samsung Galaxy Note 8 is likely to feature a 12 million-pixel wide-angle camera and a 13 million-telephoto lens, according to industrial predictions. 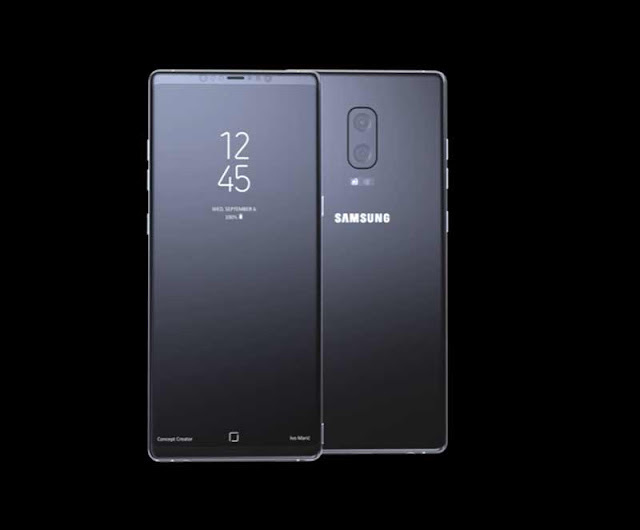 The Note 8 phone is also expected to maintain the 18.5 to 9 ratio and have a Super AMOLED display with 4K resolution (3,840 x 2,160 pixels). Samsung declined to comment on the rumors. Meanwhile, the company is preparing to launch a refurbished version of its ill-fated Galaxy Note 7, dubbed the Galaxy Note FE, next month at the earliest before the debut of the Note 8.